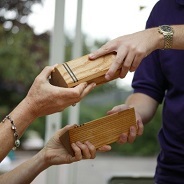 This indoor or outdoor team building experience is based around 50 signature mobile wooden blocks. The team must work together to complete a series of tasks and exercises assigned by the facilitator. As they reflect on each exercise they will gain insight and knowledge on the importance of team work. Watch team members instantly become energized as they laugh, slip, fall and learn to help, hold on and rely on each other for success. Managing Change, Conflict, Communicating with Different Personalities and More!